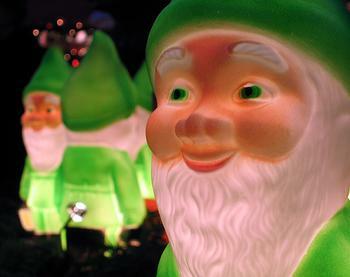 Union Square, New York City, December 23, 2003. The Food Section will return with a full menu of postings on January 5, 2004. Shopping List: Eric Bordelet Poiré "Granit"
In the run-up to Thanksgiving, Howard Goldberg, writing in the New York Times, recommended a French apple cider, Eric Bordelet Sydre ''Argelette," as an alternative pairing for Turkey. The bold, golden apple cider is excellent, but so is another of Mr. Bordelet's offerings, Eric Bordelet Poiré "Granit," a sparkling cider made from pears. Much drier than the apple version, the pear cider is made in Normandy from the the fruit of trees grown in a soil composed of granite. The cider is akin to a sparkling wine or champagne infused with the crispness and subtle sweetness of pear. 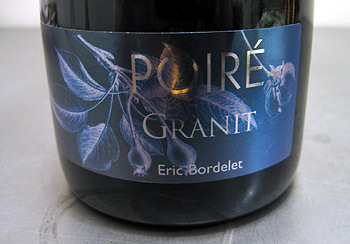 Eric Bordelet Poiré "Granit" is $17.99 at Nancy's Wines for Food, 313 Columbus Avenue (212.877.4040). 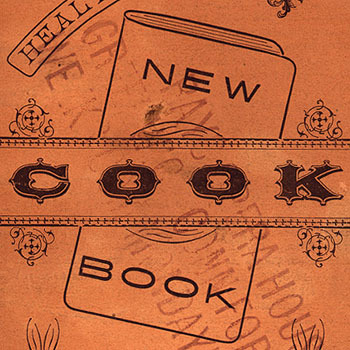 The cookbook awards bestowed by the International Association of Culinary Professionals and the James Beard Foundation won't be announced until spring 2004, but the food media has been publishing its own lists of the best cookbooks of 2003 at a breakneck pace over the past few weeks. In an unscientific survey of the eight lists collected below, Paula Wolfert's The Slow Mediterranean Kitchen: Recipes for the Passionate Cook and Marcus Samuelsson's Aquavit: And the New Scandinavian Cuisine share the title for most frequently mentioned book on a "Best of 2003" cookbook list. Both books appeared on seven out of the eight lists. I must admit that I do not own a single one of these books, so I am forced to recuse myself from casting my own vote. That said, I would give a nod to another frequent mention on these "best of" lists, Alice Medrich's Bittersweet: Recipes and Tales from a Life in Chocolate, based on her past work. Do you have a personal recommendation for any of these acclaimed books or for others that deserve attention but did not make the list(s)? Image: From Healy & Bigelow's New Cook Book (1890), Advertising Ephemera Collection - Database #A0160, Emergence of Advertising On-Line Project, John W. Hartman Center for Sales, Advertising & Marketing History, Duke University Rare Book, Manuscript, and Special Collections Library. 2. Italian Christmas Fish Feast, cooking workshop with Micol Negrin, Saturday, December 20, 10:00 a.m., at The James Beard House, 167 West 12th Street. Members $50, guests $60 (212.627.2308). 3. Wine Talks: A Slightly Less Serious Look at French Wines is a series of wine lectures and tastings at Paradou. The next installment, on the subject of “Bordeaux vs. Burgundy,” will take place on Monday, December 22, 6:30 p.m., at Paradou's Meatpacking District location (8 Little West 12th Street, between 9th Avenue and Washington Avenue), and on Tuesday, December 23, 6:30 p.m., at Paradou's Park Slope, Brooklyn, location (426 Seventh Avenue, between 14th and 15th Streets). $45/person in Manhattan, $35 in Brooklyn. Call 212.463.8345 and 718.499.5557 for reservations. 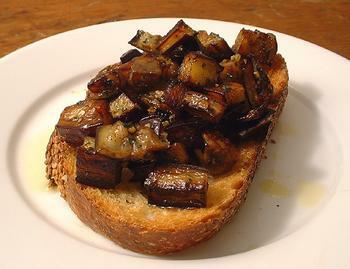 Eggplant often falls apart when it is sautéed, but in this preparation for bruschetta with melanzane al fungho, "eggplant cooked in the style of mushrooms," small pieces of eggplant retain their shape, browning on the outside and cooking completely through to the center. The pieces of eggplant never end up looking much like the mushrooms promised in the name of the recipe. Rather, the mushroom is more of a metaphor for how the eggplant remains in small, seperate pieces while sautéing, akin to how little mushrooms might be cooked. The key step in preparing the eggplant and obtaining the metaphorical mushroom effect is to cook it in a single layer in the pan and let it brown without stirring. 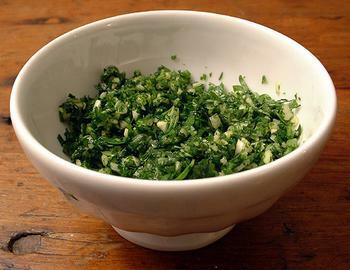 The recipe, from Mario Batali, actually indicates that you should stir it. However, in the original episode of the television porgram, which I saw, Mr. Batali made the point that the eggplant should be left alone so that it retains its form and does not break up. 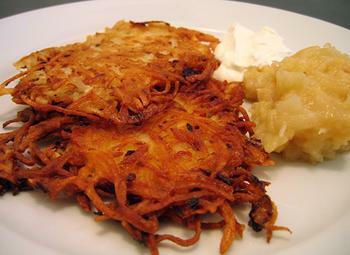 Once it has cooked completely on one side, flip the pieces over carefully so that they do not fall apart. The recipe and method are open to variations. In the above example, I added a few drops of balsamic vinegar to add some acidity and additional flavor. With the concentration of olive oil in the eggplant as it cooks, this is a very rich topping for bruschetta, and it makes for a filling meal accompanied by a salad. 1. Cooking Demonstration with Riad Nasr and Lee Hanson of Balthazar, Pastis, and Schiller's Liquor Bar, 3:00 p.m., Saturday, December 13, at Broadway Panhandler, 477 Broome Street. Free (212.966.3434). 2. Wine Talks: A Slightly Less Serious Look at French Wines is a series of wine lectures and tastings at Paradou. The next installment, on the subject of terroir, will take place on Monday, December 15, 6:30 p.m., at Paradou's Meatpacking District location (8 Little West 12th Street, between 9th Avenue and Washington Avenue), and on Tuesday, December 16, 6:30 p.m., at Paradou's Park Slope, Brooklyn, location (426 Seventh Avenue, between 14th and 15th Streets). $45/person in Manhattan, $35 in Brooklyn. Call 212.463.8345 and 718.499.5557 for reservations. 4. SQC chef Scott Campbell will interview Steven Jenkins, co-founder of Fairway Market and author of the Cheese Primer, on Tuesday, December 16, 4:00 p.m., at SQC, 270 Columbus Avenue (between 72nd & 73rd Streets), reservations recommended (212.579.0100). The free event is part of the ongoing "LIVE @ SQC Talk & Tasting Series," featuring interviews between Mr. Campbell and notable chefs and writers in a "TV Talk Show Format." I took this photograph four years ago on a visit to Memphis, Tennessee, with my father. Throughout the trip, we came across many variations on the barbecue joint sign, invariably featuring a pig in some kind of pose, and caught this one when we were in nearby Clarksdale, Mississippi, to visit the Delta Blues Museum. 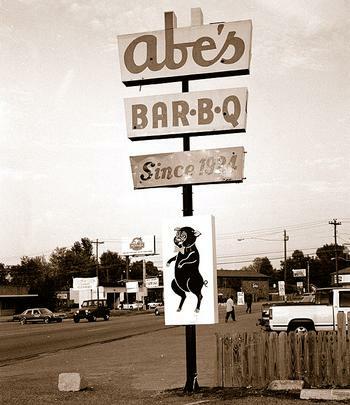 We never made it inside Abe's, but the food sounds good. 1. Food Forum: Edo Culture and the Essence of Japanese Cuisine, a lecture and tasting of traditional Japanese foods from the Edo period, 6:30 p.m., Thursday, December 4, at the Japan Society, 333 East 47th Street. $15/non-members, $10/members (212.832.1155).